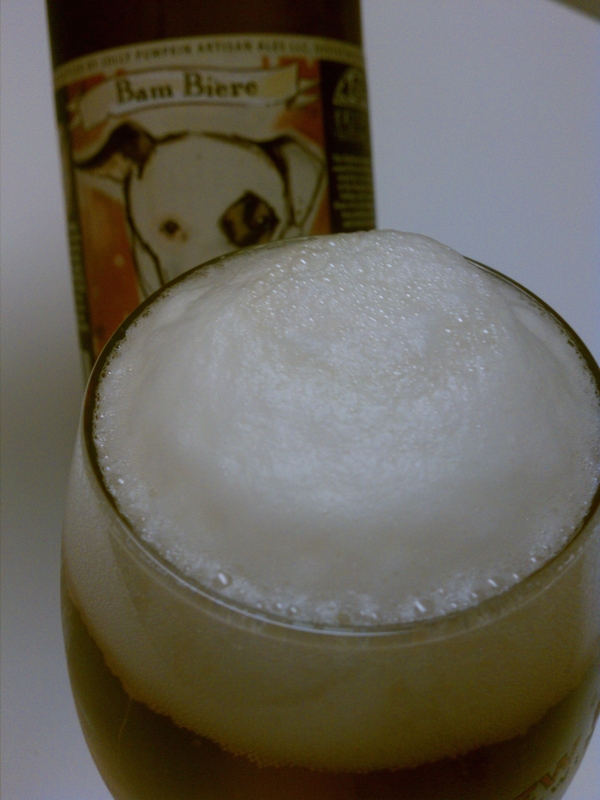 This delicious farmhouse ale is named for our Jack Russell, who struck by a car, bounced back in fine tenacious Jack Russell fashion, and is brewed for those of us who knocked down, have picked up, dusted off and carried on undaunted. Golden, naturally cloudy, bottle conditioned and dry hopped for a perfectly refreshing balance of spicy malts, hops and yeast. Please enjoy our beers in good health, And look both ways when crossing the street! Appearance– A bit hazy, straw golden in color. Huge pillow white head that won’t die. Gets nice and rocky after a minute or so. Great fizzy bubbles cascading through glass. (It should be noted I used a New Belgian glass with etch marks in the bottom) Nice lacing after the beer is finished. Aroma– Lemon and Citrus are upfront. Followed by a nice pleasing barnyard funk. In the finish a white wine, nutmeg and faint vanilla aroma. If I really searched for anything else I would say white grapes. Taste– Again lemon and citrus first in the taste. This citric and lactic tartness along with the hop bitterness really wowed me from the first taste. Peppery and some cinnamon orange flavors come in near the end. Overall– One thing I love about this beer is how dry it is. No sweetness which keeps me coming back for another sip. To me this beer is all about “drinkability”. I would go so far as to call this the apex of “Sour, Wild, Funky” session beers. It has enough lactic sourness , enough Brett, and enough Belgian yeast flavors to make your pallet happy while being able to enjoy multiple glasses. 1.20 oz. Crystal Pellet 3.80 18.6 60 min. 0.80 oz. Crystal Pellet 3.80 6.5 30 min. 0.50 oz. Crystal Pellet 3.80 0.0 0 min. you can dry hop with .25-.50 oz. For this recipe I was worried about percentages so the amounts for the grain is odd feel free to round up if you like. I actually just bottled this exact recipe from the Can You Brew It show. However, I just realized that I had a disconnect between my brain and hand while writing down the recipe from the show… I used 1.5 oz of french oak cubes and 1.5 oz of american oak cubes and let the beer set on them for two weeks. 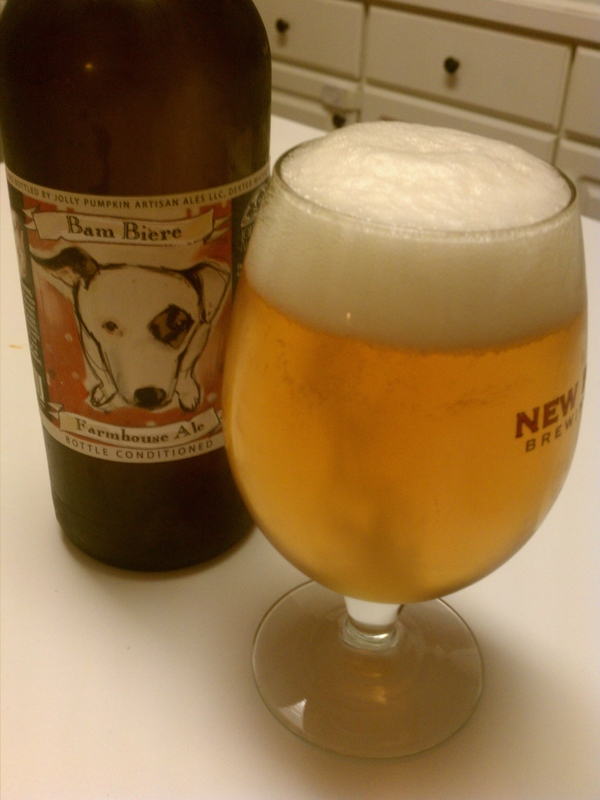 The beer didn’t quite have the Bam Biere taste, so maybe that’s where I screwed up! haha It’s still a great beer, and my first foray into sours. Also the first time I cultured yeast from a bottle. Great post, and I couldn’t agree more about this being an excellent session sour. Doh! Well maybe its time to brew another batch? How long did you let the “bugs” ferment for? I grew up whatever wild yeasts/bacteria thats in the Bam Biere for about 2 weeks before the start of ferment. I also added a healthy starter of WLP550 at the same time. I let it ferment for about two weeks, then another 2 weeks with the THREE (ha) ounces of oak, then an additional month or so before bottling. I was a little nervous about bottling after that long but the gravity had gotten down to around 1.003/1.002 so I figured it would probably be alright. It’s definitely not a clone of the original beer but not a bad creation when it’s “all-said-and-done” Have you brewed this particular recipe before? Do you have any idea on carbonation time? I’m bottle conditioning them and figured they’d take quite some time. Any thoughts? Bryan- I haven’t brewed this one before although I probably should since I’m a big fan. I think where you could improve the beer next time is to let it sit longer. Those Bam characteristics you are missing are most likely underdevelopment of the “bugs” 2-ish months isnt really enough time for the flavors to develop. Minimum of 90 days. The beer will change and continue to develop in the bottle. Make sure you hold onto some to taste this time next year. If you bottle conditioned with sugar and they are at around room temp, I’m betting you will be carbed up in 2-3 weeks. Brandon- How long did you let the beer sit in the fermenter before you bottled? I’ve not made any funky beers yet. Do you add priming sugar or could the still active Brett. and bacterium over-carbonate the beer and make bottle bombs? @Matt-I haven’t brewed this recipe yet. It was brewed by the Can You Brew It team. You will want pretty much any sour or funky beer to ferment down pretty far (1.005 and under) so you can avoid the bottle bomb issue. The brett will get it down there, but it will take atleast 3-4 months. I prime my bottles with sugar or KreamyX. Does lacto continue to produce CO2 after the Brett attenuates? I think this is invaluable information, at least an invaluable lesson to me. I brewed this recipe a little while back and am enjoying the results now. 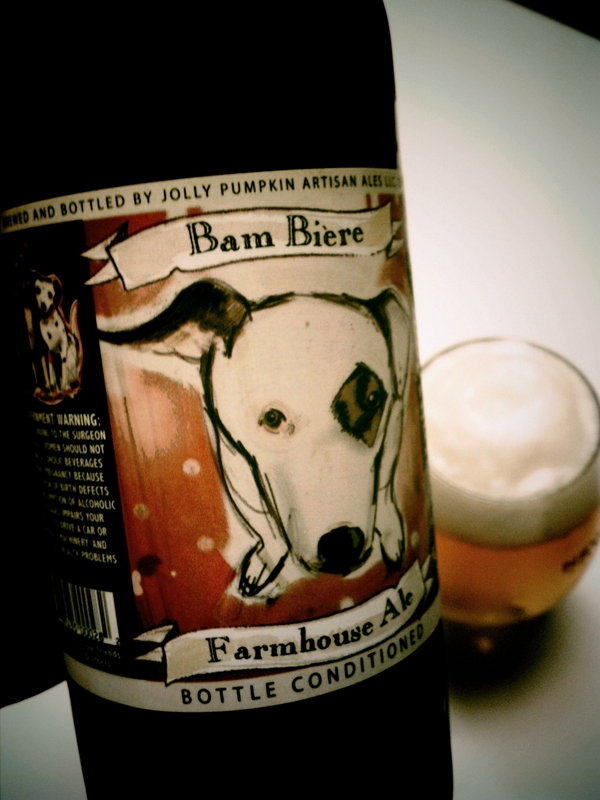 My attempt is really close to Bam Biere flavorwise and a wonderful drinking beer. My efficiency was higher than expected during the brew so I ended up with a higher ABV, more like an ES Bam. I fermented with WLP550 and then added JP dregs that I had built up on a stir plate into secondary.